In today's guide, you're going to learn how to finally get rid of that dreaded black algae in your pool. But you'll finally understand what black algae actually is, why it's so bad for your pool, and how to also prevent it from ever coming back again. Following the steps outlined in this guide has allowed my family's swimming pool to remain mostly black algae-free for a while now. What is black algae & why is it bad for your pool? Black algae are living, growing organisms that, unless taken care of quickly, can overtake your pool and cause severe structural damage. And it’s hard to get rid of because its roots grow into cracks in the cement and don’t like to let go. It also has a lot of protective layers that help it ward off the chlorine that should kill it. Any algae, including black algae, tend to bloom in bodies of pool water with a high pH level, low chlorine, bad circulation and filtration and not enough chlorine. It will flourish in a warm pool with lots of sunny days. Because of its appearance, black algae look a little frightening. I mean, we’ve all been warned of the health risks of black mold! But it’s actually not harmful to humans all by itself (source). The health risk comes from the fact that algae can harbor harmful bacteria like E. coli. It’s important to note that not every dark spot in your pool is necessarily black algae, though. Before you begin the lengthy process of removing it, it’s a good idea to identify whether or not the culprit is in fact what you think it is. The spots are black or blue-green with raised heads, not free-floating. The algae harbors in rough areas of the pool plaster. It doesn't brush off the wall easily. The algae is found in pools even with proper filtration and sanitation. It's not to be confused with mineral staining, which can discolor the surface (black), but won't scrape off. For all these reasons, the best cure is definitely prevention. If you can stop it before it ever starts to grow, you won’t have to spend hours trying to get rid of it. Here are our top tips for preventing black algae from growing in your pool. Black algae can get into your pool several ways, but one of the most common is from swimming suits that have been in the ocean (source). Those pesky little spores stick to the cloth and hop off in the pool the first chance they get, so be sure to use bleach to clean them. Regularly checking and regulating your pool's chemistry, like pH, alkaline and chlorine levels will combat any infestation that may be threatening to erupt. Running your pump for 8-12 hours every day will help filter off tiny spores that are too small to see. Blue Devil Pool Wall Brush Deluxe with Poly Bristles - 18"
Even if you have the cleanest pool in 9 counties, an infested pool noodle or floatie will muck up your summer fun before you know it. So, let’s say you forgot to read up on this before your pool got infested. Or maybe you’ve never had black algae before and the attack just caught you off guard! Either way, no need to worry! You can get rid of it. It will just take a little (or a whole lot) of elbow grease. Follow these simple instructions and we’ll have you back in the water in no time. First you'll need to sanitize everything you’re going to use so that you can make sure you’re not adding more algae to the pool. You can do this by spraying and scrubbing it down with a chlorine solution. If there are algae in your pool, it is definitely in your filter, even if you don’t see it. Be sure to follow your manufacturer’s directions for cleaning it, and remember that sand or DE filters will need to be backwashed and rinsed a couple of times. Use your nylon brush to scrub the sides and bottom of the pool as many times as it takes to make sure all the pool algae are brushed away. And, then brush it one more time for good measure! If you have a cement or natural element pool, a stiff or wire brush may be used to remove the protective layers of the algae. And while a vinyl pool is not nearly as susceptible to algae, if you happen to notice an infestation, a softer-bristled brush can be used. Now that you’ve brushed away the protective pool surfaces of the algae, the chlorine can penetrate it and get to the roots. Break one in half and use the rough side to scrape the algae. 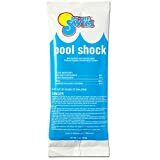 Use a good shock treatment to blast away any bacteria and growths that might be lurking in the pool. To do this, you will need a good super shock chlorine treatment. You should follow the manufacturer’s instructions, but a good rule of thumb is to chlorinate your swimming pool water to 30 parts per million (ppm). This will destructure the DNA of the algae so that it can be more easily removed. CLEAR WATER FOR SAFE SWIMMING - Swimming in crystal clear water does not mean your skin has to suffer. The granular chlorine is 99% sodium diclor making a relaxing swim not as harsh. LONG LASTING - Dichlor resists UV light, lasting longer than other types of chlorinating supplies due to built in stabilizer for your swimming pool, hot tub, or spa. Follow the manufacturer’s instructions for adding granular chlorine to your pool, being especially generous with it in areas where you scrubbed away algae patches. If your pool has a dark surface, you may need to skip this step, as it could cause discoloration. Algaecide is a chemical created for killing and preventing the growth of algae. One bottle of algaecide should treat 15,000 gallons of pool water. Use it accordingly. This will help prevent future outbreaks. After you have given the treatment 24 hours to settle, run the pump for the next 24 hours solid and then 8-12 hours a day every day of the season after that. If you have a dark-colored pool, you will want to run the pump immediately to prevent discoloration of your pool’s surface. Brush your pool 2-4 times a day during the next few days to keep removing spores that may still be lurking. You will need to clean your filter again to remove any residue from algae that has been brushed away from the sides of the pool. Once again, DE and sand filters need to be backwashed and rinsed a couple of times to make sure you’ve removed any organisms. If the algae in your pool are stubborn, you might notice a black spot starting to creep back in here and there. If that’s the case, shock your pool again and continue with the brushing process at least twice a day. Now that you’ve done all the hard work and would like to just enjoy your pool, you can see how important it is to stay on top of this task. Every week, you should be doing regular pool maintenance such as brushing it down and vacuuming, checking your pool’s chemistry levels and cleaning out your filters. You will also want to make sure to run your pump daily and clean any items entering the pool, including your humans. Keeping your pool gunk-free doesn’t have to be difficult if you stay ahead of the chore. Hi guys! My name is Mike, aka Pool Care Guy. I'm here to help you make sure your pool is clean, healthy, and pristine. Most of all, I'm here to guide you along so you spend more time swimming in your pool than you do cleaning it! Hi guys! My name is Mike, aka Pool Care Guy. I'm here to help you make sure your pool is clean, healthy, and pristine. Most of all, I'm here to guide you along so you spend more time swimming in your pool than you do cleaning it! From ultimate guides to pool care tips & tricks, I hope you find something that makes your pool your happy place. Pool Care Guy is a participant in the Amazon Services LLC Associates Program, an affiliate advertising program designed to provide a means for sites to earn advertising fees by advertising and linking to Amazon.com. Amazon and the Amazon logo are trademarks of Amazon.com, Inc. or its affiliates. Important Disclaimer: The information contained on Pool Care Guy is intended for informational and educational purposes only. Pool Care Guy is a participant in the Amazon Services LLC Associates Program, an affiliate advertising program designed to provide a means for sites to earn advertising fees by advertising and linking to Amazon. Amazon and the Amazon logo are trademarks of Amazon.com, Inc. or its affiliates.